Silk & Clean is a unique cleaning tissue, that instantly removes most stains from silk and other luxury fabrics. It works much like dry cleaning — but only the stain is treated. Silk & Clean dissolves oil, grease and other stains easily from the fabric. 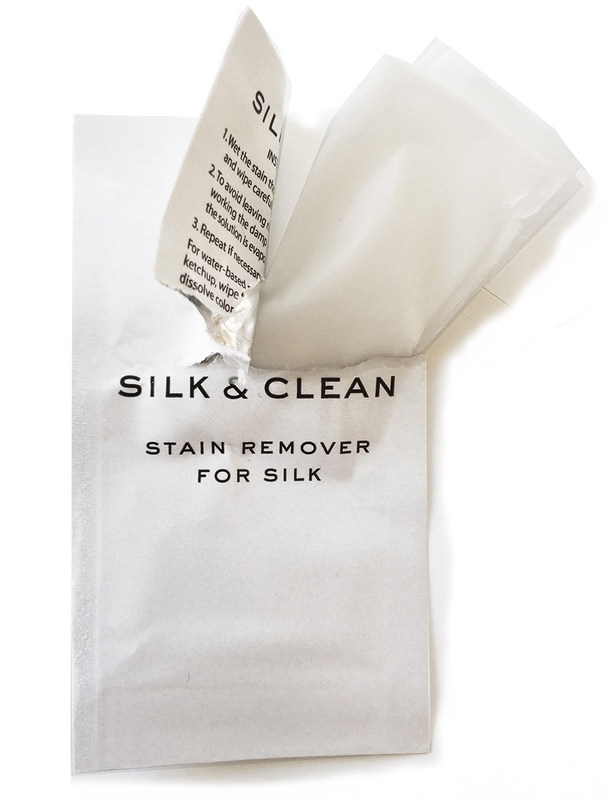 The chemical agent used in the Silk & Clean solution is kind to the fabric, human skin and to the environment. Silk & Clean is highly effective on oil-based stains as butter, mayonnaise, make-up and oil. For water-based stains such as coffee, tea, soy sauce or ketchup, wipe first with a dampened cloth to dissolve and remove colorant and then finish off with Silk & Clean.